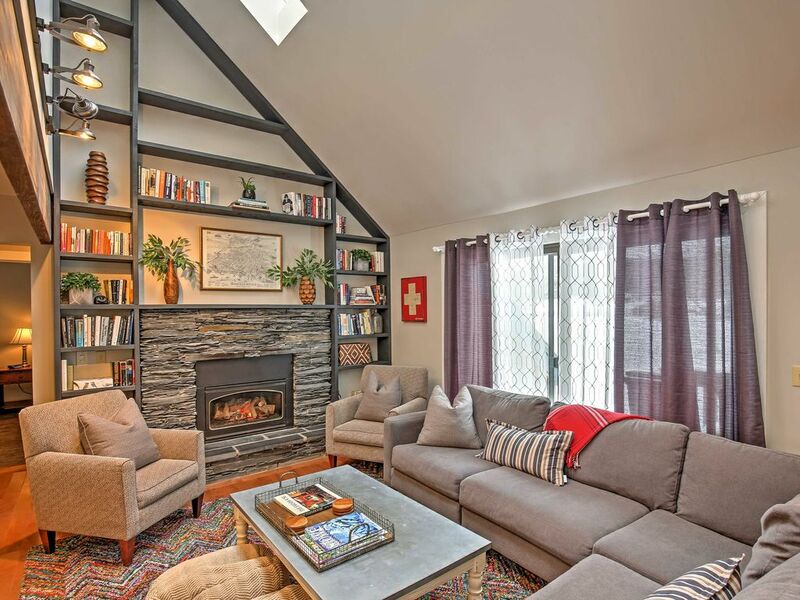 Located in the heart of Stowe in the desirable Stonybrook Community, this spacious 4-bedroom, 3.5-bath vacation rental townhome is the perfect home base for groups of 10 travelers looking to experience the best of Vermont! Come for the relaxing atmosphere and gorgeous natural scenery, and stay for the fantastic skiing! Enjoy your ski trip from the cozy comfort of this spacious townhome overlooking the famous Mt. Mansfield and snowy ski slopes; it may soon become your favorite vacation hideaway! A newly-renovated living room makes relaxation effortless after a day of skiing or hiking. You can also watch Apple TV, or your favorite DVDs on the flat-screen TV as you rest up for another day of amazing Vermont adventures. The fully equipped kitchen and outdoor gas grill provide everything you need to whip up delicious meals and snacks when you're not out and about. At the end of the day, snuggle up in front of the toasty fireplace with a hot drink and admire the views of the ski slopes. You'll love the ease and convenience of garage parking, in-unit laundry machines wireless internet access, and community amenities in this lovely townhome. Perhaps the best aspect of this townhome is the fact that you have access to tons of fantastic community amenities! With ample outdoor space and sweeping mountain views, this community encourages you to enjoy Vermont's natural beauty to the fullest. Relax on the decks, admire the unobstructed view of Mt. Mansfield, play a game of tennis on the courts or, or cool off in the community's seasonal outdoor pool. The pool, sauna, clubhouse, and tennis courts, are just steps away from the back door. Stowe, Vermont combines the majesty of Vermont's highest peak, Mt. Mansfield, with the charm of a 200-year-old village reminiscent of a classic European resort. From this location, you'll be in the perfect position to explore Stowe. The home is located just steps away from the recreation path, so you can easily take a serene stroll. While you're here, go shopping on Stowe Mountain Road, enjoy the brilliant colors of changing fall leaves, spend a wintry day skiing at Stowe Mountain Resort, or indulge in delectable cuisine at a local restaurant. Your Vermont escape is waiting! - Amenities include a fully equipped kitchen with stainless steel appliances, free WiFi, flat-screen TV with Apple TV, deck with patio furniture and views of Mt. Mansfield, in-unit laundry machines, parking, and much more! - Fantastic Stowe location in the Stonybrook Community. Take a short walk to the recreation path to enjoy the natural beauty of Vermont! wonderful weekend skii adventure with some friends. house was in great condition, all communication was clear and prompt. extremely accommodating in regard to check in. the most amazing location for nightlife, culture, and skiing. would definitely go back!! Yes, we loved our Christmas in the house! The house was clean, nice and very lovely! It was home sweet home when from the moment we walked in. Had a wonderful family celebration,in this wonderful accommodation,very well equipped.wonderful location. Beautiful chalet, warm and inviting! Well maintained! Hassle free access during arrival. Place was very clean and inviting.